Tarmac wants to extend its sand and gravel operations near Thornborough Henges close to Ripon, North Yorks. Tarmac commissioned York-based Mike Griffiths and Associates (MGA) to carry out a survey as part of its application to the county council to extend its present quarry at Nosterfield. 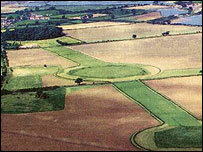 The new site at Ladybridge Farm, like Nosterfield, is near the henges which consist of three earthworks built in a line running north-south for about a mile.